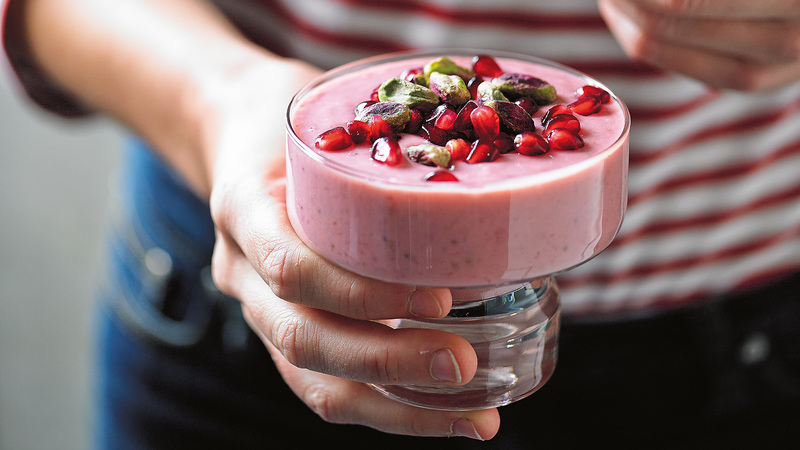 A juicy burst of pomegranate makes these sweet vegan parfaits a real treat. You’ll need 6 small glasses (about 120 ml) for this recipe. 1. To juice the pomegranate cut it in half around its equator. Squeeze each half into a bowl. Tap the bottom of the pomegranate with a spoon to expel all the seeds into the bowl, removing any pith or flesh that may have fallen in. Strain the juice into a saucepan. Transfer the seeds to a sealed container and place in the fridge. 2. Add the sugar and 180 ml (¾ cup) of water to the pomegranate juice. 3. Heat the saucepan over a medium–high heat until the sugar dissolves. 4. Add the cornflour and salt and stir continuously until the liquid reaches a high simmer. Reduce the heat to low and cook, still stirring, for 30–60 seconds longer until the liquid is very thick. Set aside to cool. 5. Place the strawberries and tofu in a food processer and process until smooth. Add the cooled pomegranate syrup and blend until creamy. 6. Divide the crushed pistachios between the 6 glasses. Spoon the parfait mixture into each glass and refrigerate for 8 hours or overnight. 7. When ready to serve, top each parfait with whole pistachios and pomegranate seeds. Recipe from Suzy Spoon’s Vegetarian Kitchen, available now from Pan Macmillan.